Any smooth surface exposed to public vandalism and everyday wear and tear can be easily and inexpensively protected by Graffitigard®. Similar in construction to a safety film product, Graffitigard is a clear removable protective film, engineered to protect surfaces from spray paints, gouging and scratching. Once Graffitigard is installed, it acts as an invisible barrier between your valuable property and malicious vandals. After an incident you dont have to worry about costly clean-up. 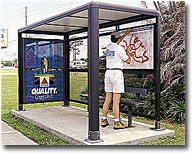 Graffitigard is easily removed and a new piece can be quickly installed. Protect your property from a vandals next target with Graffitigard. Window Film New York Put Graffitigard to work protecting glass doors, elevators, transit shelters, bus windows, information kiosks - anywhere! Glass on store fronts are being vandalized by individuals using diamond cutters causing a deep gouge scratch in your windows. We offer an effective solution to warding off these inconsiderate individuals. Contact us for a demonstration to show you why using our graffiti protection is a form of insurance saving you thousands of dollars for window replacement.